According to the United States Department of Agriculture, or USDA, bread falls into the grain group. This group includes all foods based on wheat, barley, oats or any other cereal grain. Other grain foods, such as pasta or oatmeal, count as bread substitutes at a one-to-one ratio. The USDA makes daily serving recommendations of grain foods in general rather than specifically bread. You don't need any bread to stay healthy; any grains can meet your needs. The number of servings of grain that you need per day depends on your age, gender and level of physical activity. In general, the USDA recommends that moderately active women aged 19 to 50 consume six servings per day, and women over 50 consume five servings. Moderately active men aged 19 to 30 need eight servings, men aged 31 to 50 require seven and men over 50 need six. Children and teens require fewer servings than adults. Those that participate in strenuous activities need more. Work with your doctor to create an optimum nutritional plan, especially if you have any medical conditions or other special considerations. Whole grains, which contain all parts of the grain kernel, contain the most nutrients and carry the most health benefits of all grain products. Whole-grain products include whole-wheat bread and brown rice. The USDA recommends that you consume whole grains for at least half of all your bread or other grain foods. Refined products are milled to remove the bran and germ. Refined grains include white bread and white rice. Enriched grains are refined products with added nutrients. Choose enriched rather than simply refined bread and other grains whenever possible. One slice of bread is a single serving, but not all bread slices are created equal. If you are counting carbs or other nutritional components, read the labels carefully. For example, some brands of bread contain 12 grams of carbohydrates per slice, while others contain 18 grams. Likewise, some bread contains more fiber or more added sugar. 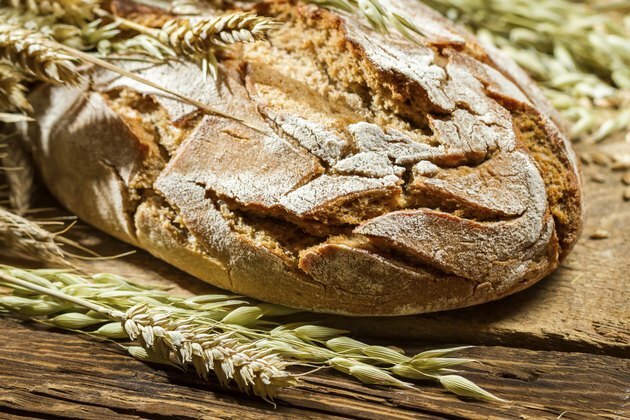 Bread and other grain products contain B-group vitamins, minerals and dietary fiber. The B vitamins help regulate metabolism and the nervous system. Minerals such as iron and magnesium improve the immune system and maintain oxygen levels in the blood. Dietary fiber is essential to bowel health. Include a wide variety of bread products and other grains in your diet to maximize your nutritional benefits. USDA: Why Is It Important to Eat Grains?